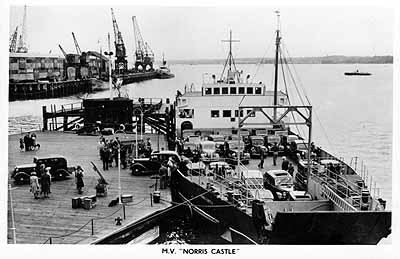 Red Funnel acquired the Motor Vessel Norris Castle in 1949 for the East Cowes/Southampton route. The vessel had been designed originally for the D-Day landings and could be loaded from the bow or from the sides. She was a relatively slow vessel with a crossing time of some hour and a half, but she did have a larger capacity that most vessels of the time. Red Funnel disposed of the MV Norris Castle in 1962.